For our "Read Across America Celebration" we celebrated Dr. Seuss' Birthday. This Bulletin Board is actually the door coming into our classroom. The idea was inspired from a picture in The Cat In The Hat. We used bulletin board paper from our schools resource room to create the scene. The window panes were cut from a card board box. The curtains are made of fabric that was purchased in the clearance section at our local Wal-Mart. The Cat is a costume that we stuffed with newspaper. His face was handdrawn on white paper and rolled up. The portion of the rug that is on the floor is covered with clear contact paper so that is is durable enough to be walked on. For an added touch the bow on the little girl's head was created from a remenant of wired ribbon. 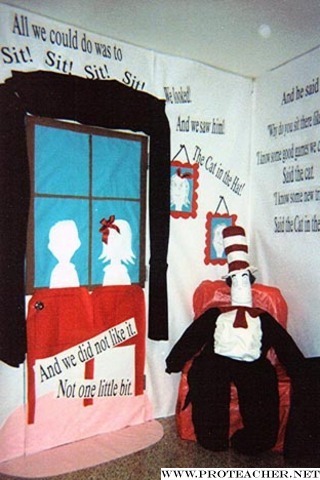 The Students loved the door they found it very inviting and were eagar to hear the story of The Cat In The Hat.